The Dollar/Yen fell on Wednesday, as the US Federal Reserve revised its rate hike and growth projections downwards, taking the equities down with it. Traders preferred to dump the USD and rush to the Yen as uncertainty surrounding Brexit and the US/China trade deal kept dragging the pair lower. Today, traders will focus on the US data to predict immediate market moves; Initial Jobless claims and Philadelphia Fed manufacturing, as Japan is on holiday for the Vernal Equinox Day. The USD/JPY broke below multiple support levels yesterday, and currently it is resting just above 110.40 (S1). 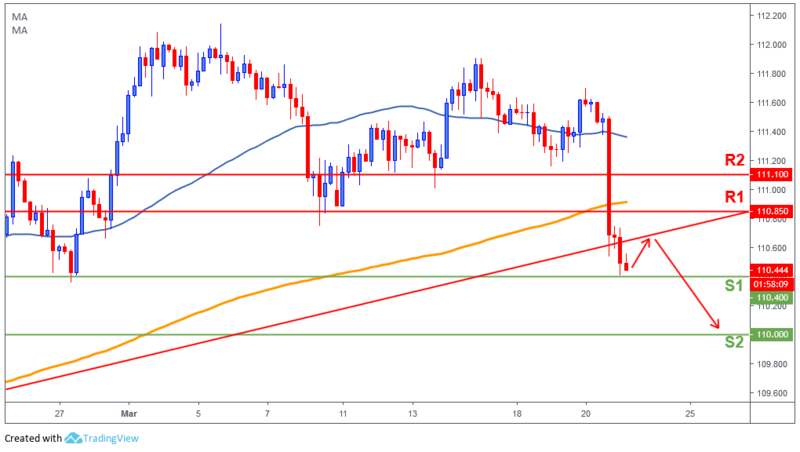 The sentiment remains bearish, as traders will try and break below this latest support to test a major psychological level 110 (S2). The Bulls need to get back above 110.85 (R1) to limit the downside.